Old case presented by Mendez is here. 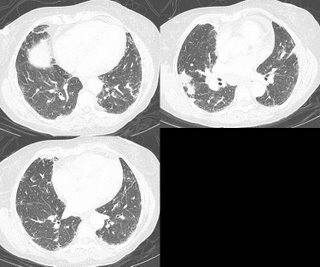 Follow up: Transbronchial bx's revealed multiple epithelioid granulomas. Special stains for AFB and fungi were negative. Symptoms improved after treatment with oral prednisone which was tapered over several months. F/U Chest CT (6 months later) revealed interval regression of peribronchovascular nodularity. Previously enlarged hilar/mediastinal lymph nodes no longer enlarged. This is a 44 y/o man who works here in the hospital. He is a ctually a nice guy so I'm trying not to find anything too interesting on his case. He is very healthy and smoked a pack-a-day for ten years but quit in 1988. He had travelled to the gul area and came back with a severe gastroenteritis. It seems that it was so bad the primary team got a CT of his abdomen. 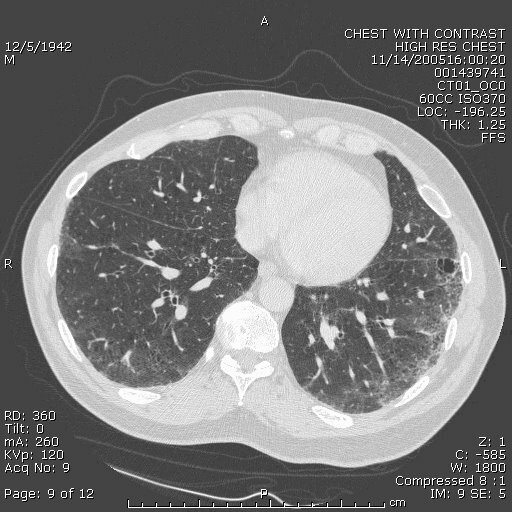 He did OK but the lower cuts of the lung revealed a ~1-cm partially calcified LLL nodule. He is completely asymptomatic from a respiratory perspective. His PFTs are completely normal. 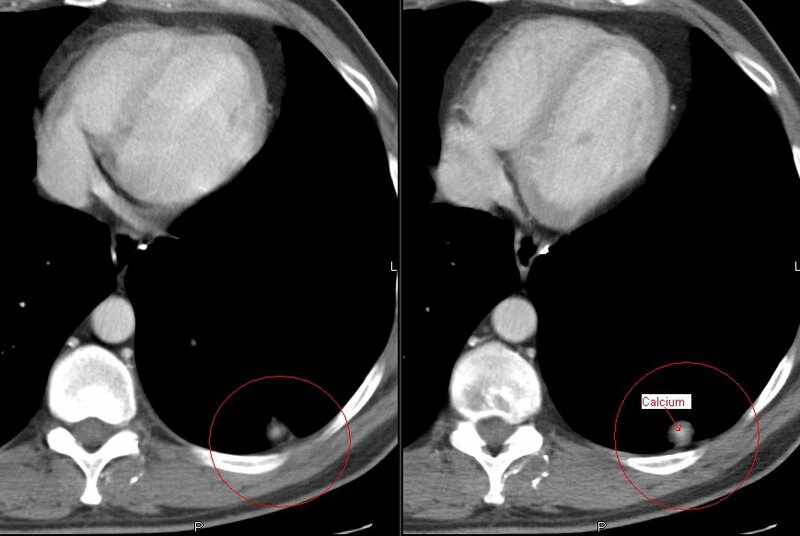 We got a dedicated CT of the chest and found the following nodules: (a 9-mm RUL a ~5-mm L apical and the same LLL). The RUL has a little bit of excentric calcium as does the LLL one. Would you PET, biopsy, watch or else? 63 year old smoker with hypoxia. CXR looks extremely hyperinflated. PFTs with ratio of 0.67, FEV1 87% predicted and FVC 93%. Lung volumes normal except for an inspiratory capacity of 73% predicted (volume done by helium dilution). DLCO 35% predicted. CT scans included below and are basically unchanged from 7 months ago. Mild mediastinal LAD, with the largest being approx 2cm. Also stable over 7 months. Would anyone pursue a biopsy of the nodes or the lung? Other thoughts? This question came up recently on this patient's follow-up. This is a relatively young man with HIV/AIDS who has done remarkably well on HAART (he had PCP 8 years ago!). He has the typical bullous emphysema associated with HIV and his previous smoking history. 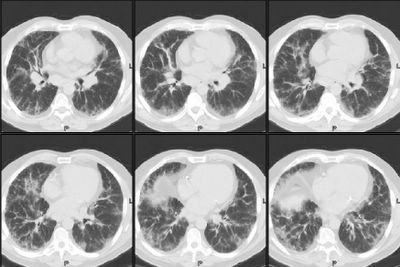 His emphysema is predominantly upper lobe (see below with a nice azygous "lobe"), he is hyperinflated and has air trapping. His FEV1 is still greater than 45% so LVRS is not for him yet anyway. However, the question came up, is HIV infection an absolute contra-indication to LVRS? 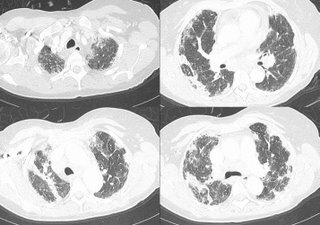 This is a 72 y/o man with a significant previous TOB Hx, moderate COPD who was referred to us for a new pulmonary nodule. He has had multiple urologic surgeries including a nephrectomy for transitional cell ca (it seems he had a "high" transitional ca of the calicial system). He has a new nodule on the contra-lateral (remaining) kidney and had a new CT and a pulmonary nodule was found. This is a LUL non-calcified nodule with no air-space disease and no thoracic adenopathy. A bronch was non-diagnostic and a PET (see below) only showed intense uptake on the nodule and nowhere else (the remaining kidney had its usual physiologic uptake). Do you think the two lesions are related? Would you try and FNA the lesion? His PFTs would tolerate a lobectomy. Would you just go straight to surgery? Well, as you might remember, this patient with a past medical history of asthma had had a few months of dyspnea and malaise. A peripheral showed 42% eosinophils and a BAL showed 20% eosinophils. A transbronchial biopsy showed eosinophilic infiltration. Micro was negative. Stool O&P was also negative. Just a quick question on alfa-1 antitrypsin replacement. Do you use weekly regimen or monthly regimen? FDA has approved only once a week regimen. But I have read that monthly regimen is also "widely used in many centers." What is your experience on this? Monthly regimen would be off-label use. Has anybody experienced a severe adverse effect with monthly regimen? I think it is my week to pick on radiation Tx... I already posted on the time delay notion (BTW, check out the PPT on that listed on the comments section). 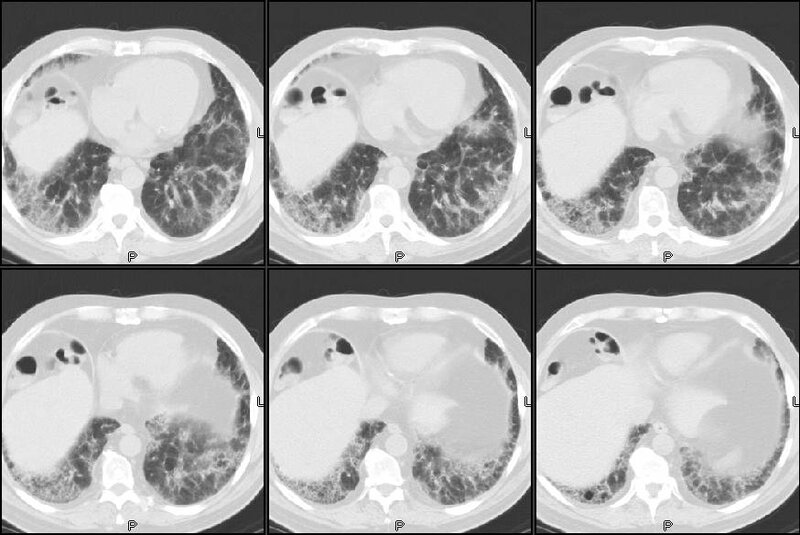 What is your impression/practice on the use of xRt and lung cancer? It certainly has an excellent role in symptom palliation, particularly with painful bony mets and other solitary mets presentations. It does decrease local recurrence (though it has less of an impact on survival) in locally advanced disease but it seems to me that it is automatically lumped with chemo as if you must have one with the other. "...led us to the decision that a below-elbow amputation would help us to decrease her morbidity and would not eliminate any significant hand function." This has come up in discussions with our hem-onc dept. 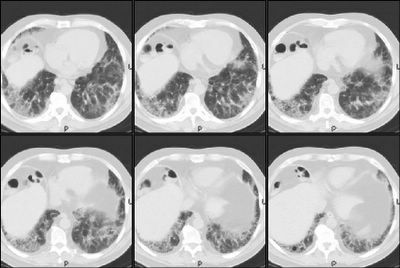 : Hem-onc has been frustrated by perceived delays from "first abnormal CxRay" to "definitive treatment". Our position is that diagnostic eval should be quick to try and identify possible surgical candidates and that 1-2 weeks (or even a bit more if they do get surgery) added on by staging and diagnostic procedures would not impact response to Chemo/xRt much. Other than perhaps the more aggressive small-cell case, chemo and xRt are usually either adjuvant or reverved for more advanced stages. Do you know of actual data looking at time from diagnosis to chemo and impact on outcomes? JJ had an interesting aside on BMI progression over time. Anybody (Lazar?) went to the ATS section on obesity and lung Dz? Any other insight on obstructive ventilatory defects, RAD and obesity? JJ had posted on the JAMA article on Varenicline (Pfizer's Chantix for smoking cessation). Has anybody had a chance to prescribe it yet? There is a reported fairly high rate of nausea but it is also reported to be mild and transient. Any experience with that? Wondering how many people out there do blind TBB's or if fluoro is pretty routine. Do people favor a particular protocol? I've seen people try to have the patient exhale, others just check if the forceps cause pain then let her rip. Would be curious to hear different techniques used out there. 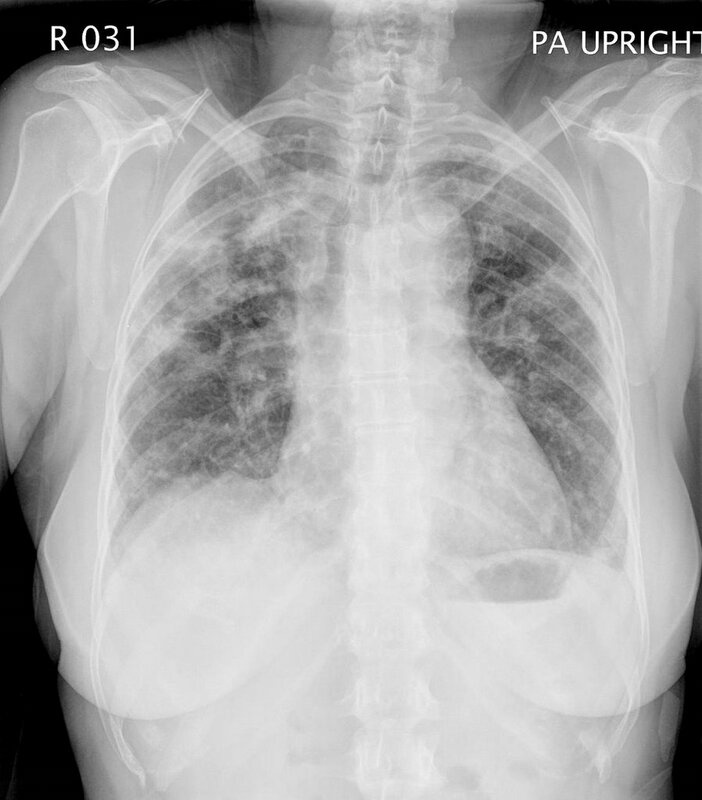 56-year-old woman with a past medical history of asthma since age 38 with 2 previous courses of steroids, otherwise well controlled who presented with increase in non-productive cough and really very minimal SOB except on exertion. 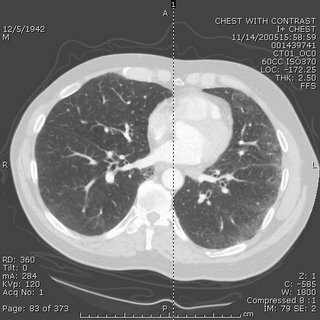 A cxr revealed b/l upper lobe infiltrates. She denies any hemoptysis and has lost about 14 pounds. She initially began her evaluation for this disease process in May 06 by ID. Her appetite is poor. A CBC showed a white count of 17 with 42% eosinophils. A BAL showed a cell count of 696 with 20% eosinophils, 40% macrophages, 11% lymphocytes. exclusion of the latter choices. I would also add ABPA to that list. Of note, the BAL was negative for all micro. 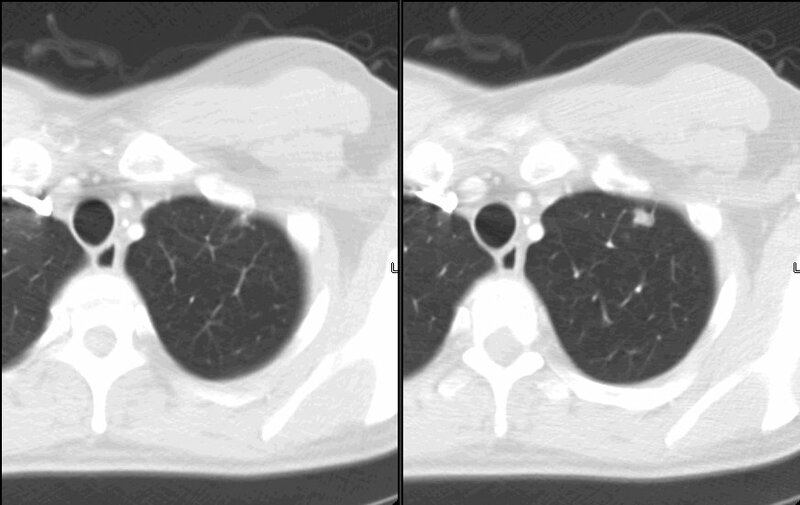 Now, my question is, would you treat this patient with steroids, since nearly everyhting on that list is trreatable with steroids, or would you proceed to open lung for a definitive dx? The reason for the latter is that even though these disease are all similarly treated, their prognosis and natural courses are different and this would be helpful for future care. 1. Active interstitial inflammation with type 2-pneumocyte hyperplasia. 2. Grocott stain is negative for fungus. 3. Ziehl-Neelsen stain is negative for acid-fast bacteria. B. Endobronchial, main carina, biopsy: Unremarkable bronchial tissue. Don't know what this means (or doesn't mean), except that I probably could have gotton away with steroids (she's in Yemen for the next 3+ months, so I wanted to know what I was treating). If she were still here, how many would treat, how many would observe, and how many would proceed with open lung/VATs Bx? The patient from Yemen came to me on 4 drug thereapy based on a 20 mm PPD and diffuse ground glass. A repeat CT again showed the ground glass. 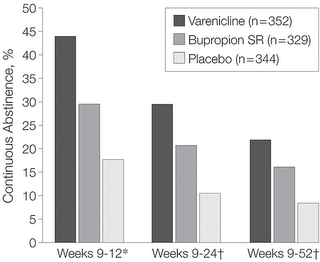 Induced sputums were negative for AFB. I bronched her and the BAL was negative for AFB or other infection. The cell count was 540 WBC's with 13% eosinophils 27% lymphocytes, 12% neutrophils and 48% macrophages. The TBBx was showed nonspecific inflammation in the interstitium and type 2 pneumocyte hyperplasia. I changed her TB regimen to another month of rifampin only for latent TB. Because of her puritis, I went this way instead of INH. Unfortunately, she is now on a plane to Yemen for at least the next 3 months. I would have liked to have gotton an echocardiogram and then an open lung. I was hesitant to start this woman on steroids and then send her off for 3 months, without having a definitive diagnosis. Are the Eos related to the ILD? This is a 69 y/o man sent to us for a persistent cough. He quit smoking some 34 years ago and has been fairly healthy. Dry cough is his major complaint and he does not complain of dyspnea. No other pertinent family or social Hx. His exam was remarkable for bibasilar "dry" crackles. No clubbing. PFTs revealed FVC and FEV1~ 53% with a TLC~ 60% and DLCO also ~65%. 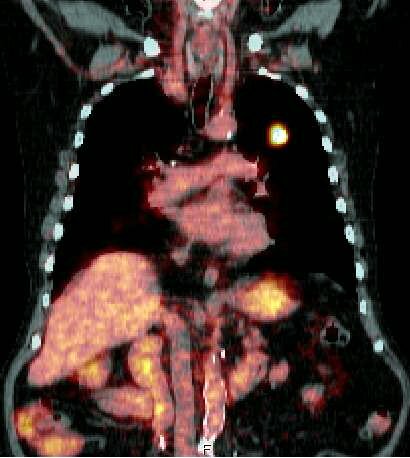 CT scan is as seen below. He had had some lab work prior to seeing us and we ordered some other tests. Of not he had a peripheral eosinophilia (11.2% - 850) and high IgE (670), ESR was 58 and ANA was negative. A bronch revealed no eosinophils, fairly pauci-cellular BAL, negative Cxs and smears and TBBX showed some interstitial fibrosis, pneumocyte hypertrophy but was basically non-specific. Would you regard this as "just" IPF or would you make anything out of the Eos and IgE? Presently, C/O an edpisode of Haemoptysis in June 2006. Lasted for 1 and 1/2 days. A similar episode of Haemoptysis occured in year 2002. 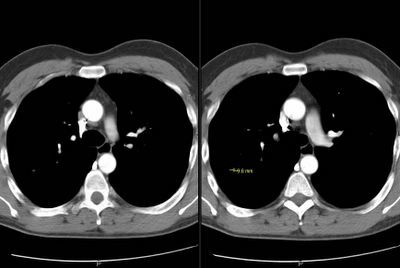 The HRCT report at that time indicated : Small (.8cm) pre-tracheal,Right para tracheal sub-carnial lymph node. The patient was subsequently diagonsed with RENAL Stenosis and a stunt was placed without incident. MRI findings : 1. Fibre lesion in right middle lobe. 2. No evidence of pleural effusion/thickening. 3.Small sub-centrimeter, pre tracheal, right para tracheal sub carnial lymphnodes. However, no evidence of significant mediastinal lymphadenopathy. FOB + Biopsy : Bronchial mucosa shows foci of inflammatory cells in the stroma and focal area of squamous metaplasia. Question: Is it Lung cancer : Stage 1? If not, appreciate if you can guide us further. 47 y/o female who is a resident of Yemen emigrated to USA 3 years ago presents with progressive dyspnea on exertion and also clubbing noted on physicial exam. Patient does not speak English , hence the history was obtained from her husband who has accompanied her to the clinic today. Six months ago she developed a nonproductive cough. She denies any hemoptysis. No weight loss. She states that she has been exposed to her sister-in-law who had TB. Patient denies any night sweats or weight loss. She had a PPD placed and it was 20 mm. ALso, she had a CT scan of the chest done which showed extensive abnormal areas of groundglass in a diffuse and symmetric pattern, and less prominent, septal lines most prominent at the bases.Patient denies any nausea, vomiting,diarrhea, constipation, abdominal pain, chest pain at this time.Patient denies any weight loss, fevers, or chills. She was put on 4 drug TB regimen and then 3 sputums were induced which were all negative (and cultures all negative for 63 days). That's when I see her - 3 months after the regimen was started. To ME, she denies any dyspnea except waking up at night gasping for breath once or twice a week or two. She does have a non-productive cough. When I saw her she has itching and redness on the back of the hands. Her repeat CT again shows diffuse ground glass pattern. No opacities or lesions or infiltrates. No adenopathy. An ANA screen was was "positive", but titers not done. So now I am stuck with someone of 4 drugs without evidence of active TB and with itching that is likely from one of the drugs. I am about to bronch her for the ground glass. Any comments/thoughts? How would you approach this case? I see a lot of obese patients with mild to moderate obstruction on PFTs without smoking Hx or a clear Hx of asthma and atopy (TN has a state average BMI of 29). There was an ATS session on obesity and airways disease and a lot of interest on this correlation at NIH. Did any of you attend the symposia on this topic? Would you manage this obstruction in a different way for this patients? 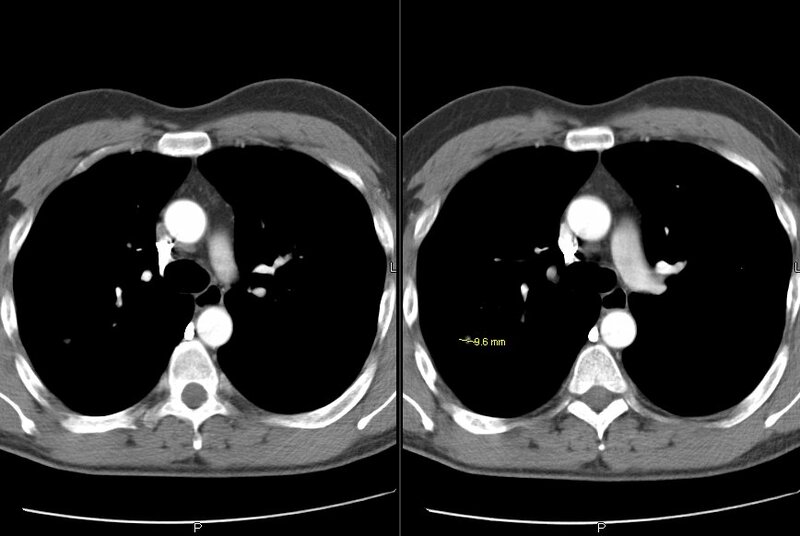 A 68 y/o woman with a long-standing history of Rheumatoid Arthritis and Sjogren's Syndrome (well controlled on Prednisone 7.5mg QOD, never used a steroid-sparing agent), was referred with mild but progressive dyspnea on exertion for several months. Full pulmonary function studies show an FEV1 of 2.38, which is 102% of predicted. The FVC was 3.22 or 100% of predicted. The FEV1/FVC ratio is 74%. 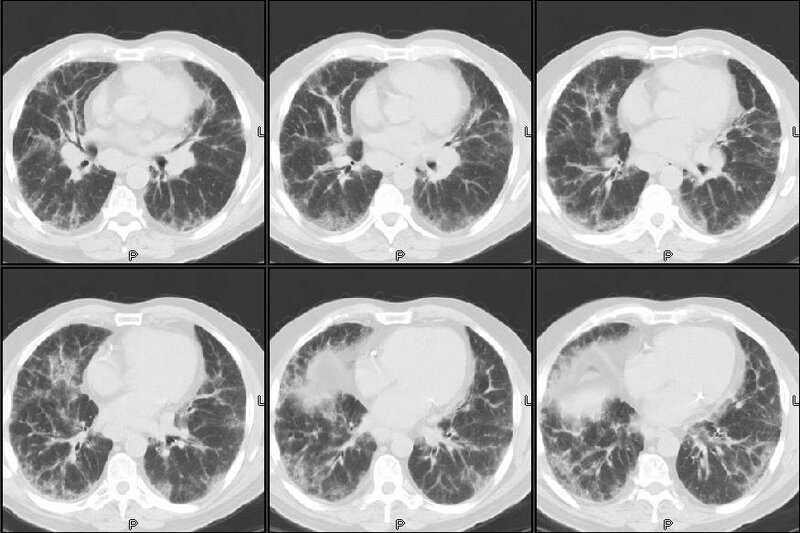 Total lung capacity is 101% of predicted and residual volume is 104% of predicted. The DLCO is decreased at 51%. This is unchanged from PFT's 18 months ago, with the exception of the decrease DLCO from 57%. thickening. There are areas of lobular spareing. No intrathoracic lymph node enlargement." 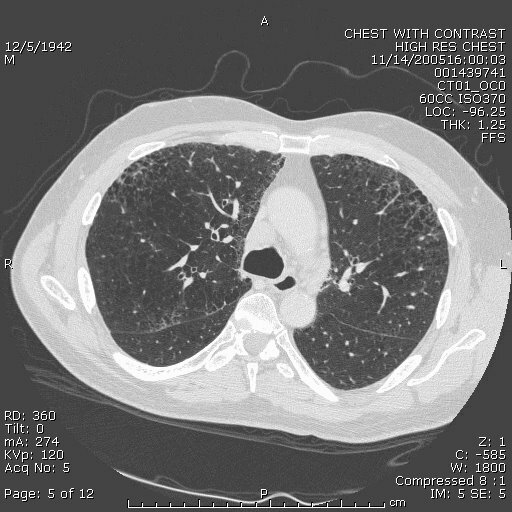 A subsequent bronchoscopy with BAL showed no evidence of infection. The differential had 42% lymphocytes, and 54% histiocytes. 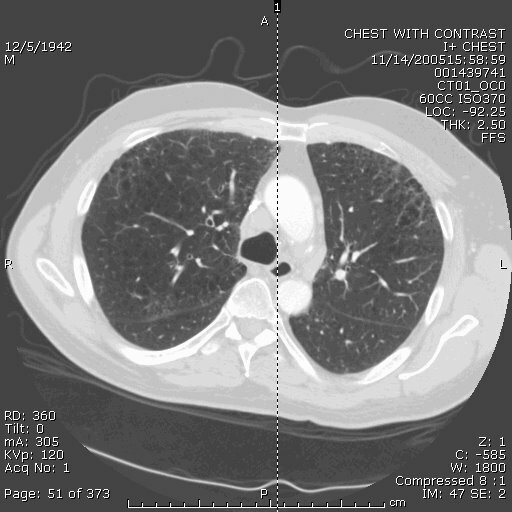 Transbronchial biopsies were read as: "Chronic and granulomatous inflammation. Amorphous acellular material. Congo red stain negative for amyloid. GMS stain for fungal organisms negative." Question: How should one approach this case? 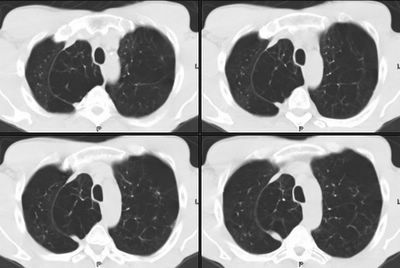 Would you take the CT scan, the lack of infection on BAL, and the lymphocytosis on BAL and treat with a presumptive diagnosis of RA-associated NSIP by increasing the steroid dose? Or would you proceed with a surgical lung biopsy. Any other thoughts? 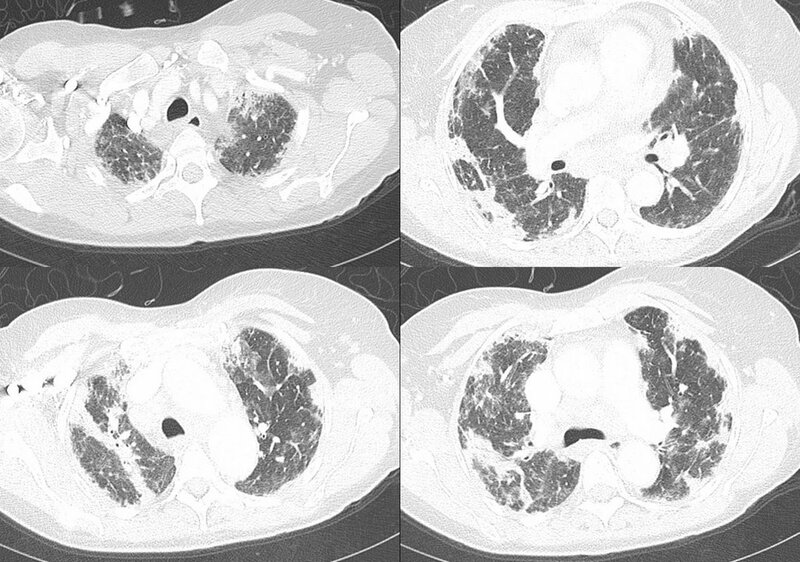 This was the 83 y/o man with no COPD, no TOB Hx with a respiratory tract infection with AFB growth from the sputum. I ended up doing a combination of the suggestions from JJ and Jeff H: I hoped and assumed the AFB was not TB but with the positive PPD, and since I should not start just INH, I did initiate therpay with 4 drugs for TB. The Cxs came back with a pan-sensitive MTb, ETH was discontinued and he is doing very well on RIF/PZA/INH.